Providing you the best range of spectrophoto meters uv-vis, digital light meter and uv-vis spectrophoto meter with effective & timely delivery. We are engaged in procuring and supplying a quality range of Spectrophoto Meters UV-vis in various models and specifications. These are required widely in Agriculture, Chemical and Food Industry for their relabel and accurate readings. Ideal for Microbiological applications and Protein analysis, these are offered in various models to meet client's requirements. 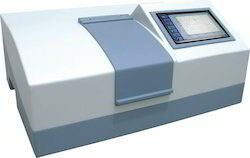 1st Lab - 2900 : Double Beam Microprocessor UV-VIS Spectrophoto Meter Range 190-1100 nm, fully automatic operations, automatic 8 cell changer, automatic wavelength scan, automatic peak picking & spectrum display. Large screen with graphic display. Spectrum and data can be printed out by printer and sent to computer via RS 232 port. Set of 4 quartz and 16 glass cuvettes. 1st Lab - 29 : Single Beam Microprocessor UV-VIS Spectrophotometer Range 195 to 1000 nm with facility for automatic concentration, %Transmission, Absorbency & K factor measurements. Sample holder with 4 positions selector control for 10 mm path length cuvettes. Interface with any printer (RS232).Set of 2 quartz & 4 glass cuvettes is provided. Software included(imported). 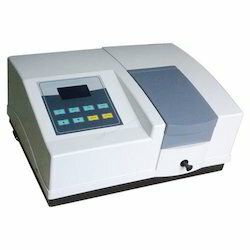 1st Lab - 31 : Digital Spectrophotometer (Double Display) Range 340-960nm with facility for automatic concentration,%Transmission and absorbance measurements. 3 1/2 digit data display,separate 3 digit LED display for Wavelength in 1nm wavelength resolution. Equipped with a set of 2 cuvettes. 1st Lab - 38 : Digital Spectrophotometer (Double Display) Range 340-960 nm with facility for automatic concentration ,% Transmission and absorbance measurements.3 1/2 digit data display,separate 3 digit LED display for Wavelength in nm with 1nm wavelength resolution. Provision for 10mm & 50mm path length cuvettes. Sensor used the exclusive photo diode & multi-colour correction filters, spectrum meet C. I. E. standard.Sensor COS correction factor meet standard. 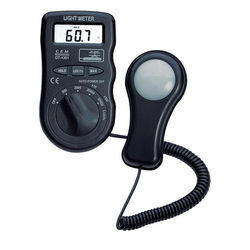 Precise and easy readout, wide range.High accuracy in measuring.Built-in low battery indicator.LSI-circuit use provides high reliability and durability.LCD display provides low power consumption.Compact, light-weight, and excellent operation.LCD display can clearly read out even of high ambient light. Looking for Spectrophoto Meters Uv-vis ?